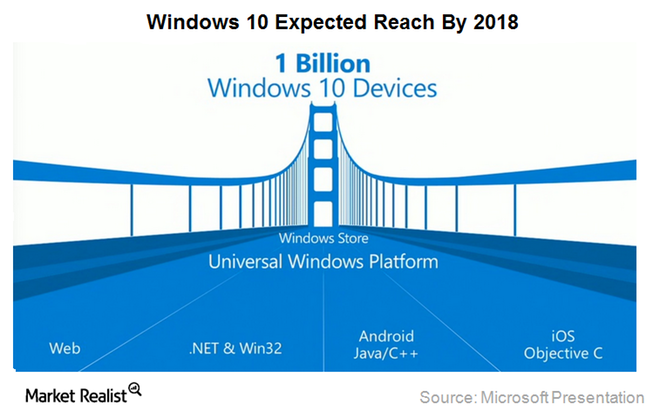 During last week’s Microsoft’s Build 2015, Microsoft declared that they intended on expanding the reach and popularity of Windows 10 as a common platform for all computing devices by offering it across all devices. Terry Myerson, executive vice president of operating systems at Microsoft, stated that the company aims to have “Windows 10 on 1 billion devices within two or three years of its release,” if they can pull this off, they will be the first operating system available on 1 billion devices! Satya Nadella‘s vision for Windows 10 is for it to serve as a common software foundation for PCs, tablets, smartphones, and Xbox, to allow seamless, uninterrupted activities across devices. With this new accessibility venture, Xbox users could easily move between their saved game files and data on their console to their Windows 10 PC while smartphones and their owners’ parent desktops could share information more easily than ever. As a Microsoft Partner, we at Ayoka provide custom software development with web and mobile application services, along with database development and integration services with .NET and other open-source APIs. We work hard at Ayoka to earn your trust as a local Texas software development company. The best demonstration of our customer service is what transpires during our in-person, face to face meetings. Contact us today at 817-210-4042 to experience the Texas difference in enterprise software development!